Have you ever had your recipe tested in a Test Kitchen? Think your recipe is worthy of a Blue Ribbon? 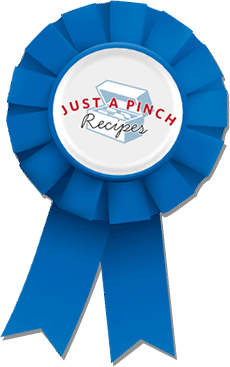 Just A Pinch has a new feature exclusively for Premium members that will send their recipe to the top of the Test Kitchen's cooking list — the Blue Ribbon Fast Track. Each year, Premium members can submit one (1) recipe for the Test Kitchen to cook using their Blue Ribbon Fast Track. The Crew will test the recipe and provide the Test Kitchen's feedback and comments. If the Test Kitchen deems your recipe ribbon-worthy, you will be mailed a real Blue Ribbon and your recipe will added to our Blue Ribbon recipe collection. Learn more about Blue Ribbons here. To participate, you must be a Premium member, and your account must be in good standing with a profile picture. Submission of a recipe in no way automatically guarantees the recipe a Blue Ribbon. If your recipe is not eligible for testing, you will have the opportunity to submit another recipe for consideration. Each Blue Ribbon Fast Track has a $50 expedition fee to cover Test Kitchen expenses and time. There are 2 ways to submit an original recipe for Fast Track. Go to your posted recipes in your Recipe Box and locate the recipe you'd like to submit. Note: Only eligible recipes of Premium members will have the icon. Then, enter your billing information on the following order page. Navigate to the recipe page of the recipe you'd like to submit for Fast Track. Click Share (you'll find this next to comments, print and edit). To be eligible for a Fast Track, you must be a Premium member who has not submitted a Blue Ribbon Fast Track within the past year, and your recipe must be original, without a Blue Ribbon and not Pinched from another site. Eligible Members cannot request to Fast Track a recipe to receive a 6th Blue Ribbon since that would elevate you into the Honorary Test Kitchen.